In 1982, Zhang Jian Long was born in Lanzhou, Gansu Province, and graduated from the Fine Arts Department of Nanyang Normal University, Henan Province, in 2004. 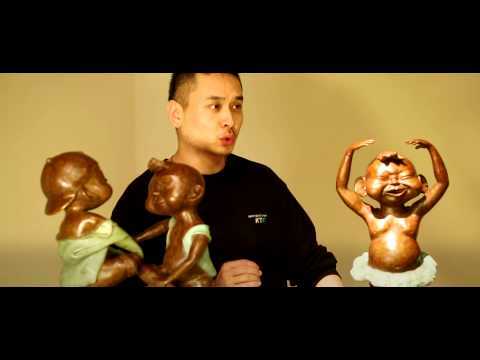 His graduation art piece was published in the 2003 Annual Works of China Fine Arts Academies and he has since exhibited extensively in China. 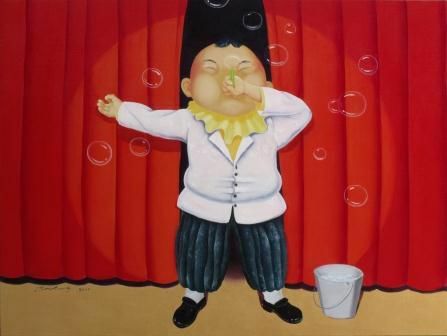 Zhang's paintings attempt to look through a child’s eyes, depicting an ideal world of innocence and joy. Free from the confines of modern society, Zhang's works show us the human spirit's full, unbridled potential while also shedding light on the constraints of modern society and 'adult' life. 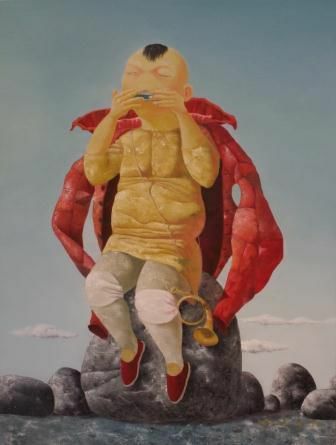 In his works Zhang Jian Long attempts to show the spirit of the people of the lost past, whom he believes were less narrow-minded in comparison with those of the present day. 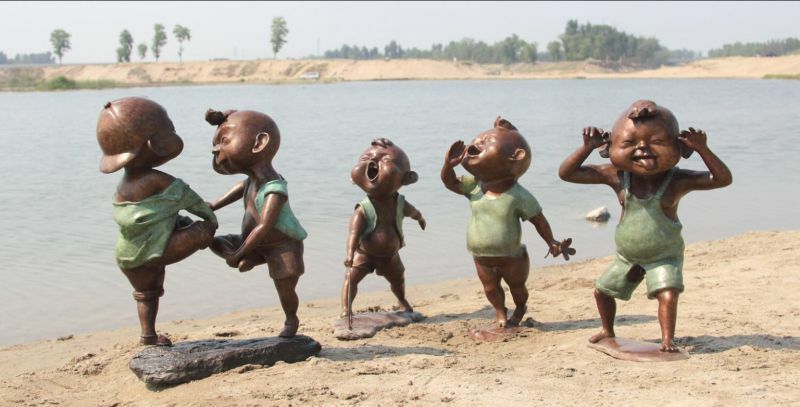 The artist creates images of childhood innocence and joy as he believes that modern culture destroys the natural rationality of humankind and influences one in a discrete manner, oppressing him from the day he was born. The state of our mind and thoughts are subjected to civilization, one which is presently causing a lack of creativity and forcing restrictions and conformity on its people. 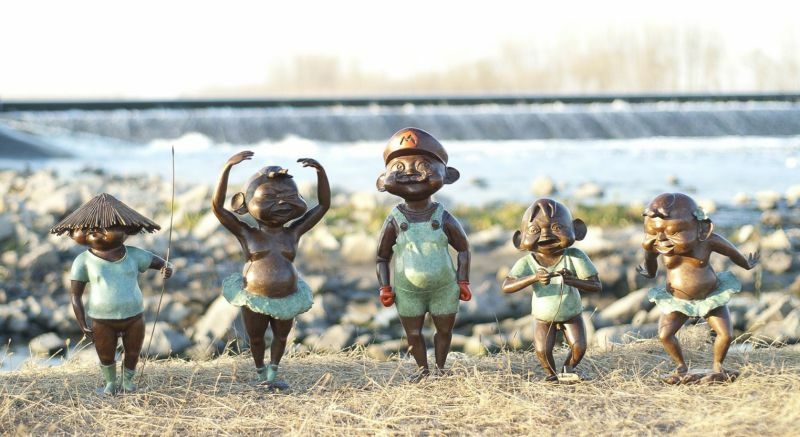 Through his works, Zhang aims to allow his viewers to go back to their childhood, where the influence of society did not affect their thoughts and emotions. In his youth, Zhang painted whenever and wherever he could. 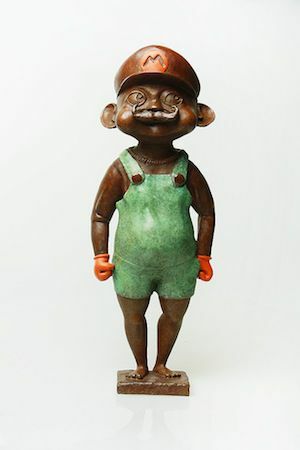 He says his works are autobiographical in a manner as they reflect the joy he experienced as a child, the singing mouths and wide smiles of his children are testament to this. When he was young, one of his teachers took him to visit a farmer, a trip that was very important to him as he was introduced to various animals, which he would later depicted in many of his artworks. 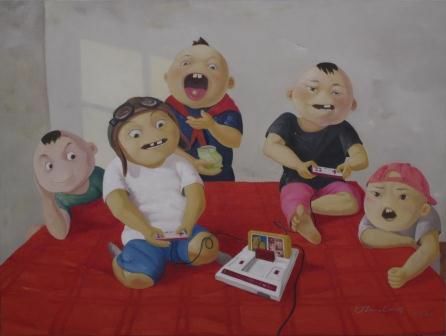 His artworks also contain many cultural references, shows, games and activities that are not only reminiscent of his own childhood, but of a whole generation of China, now lost. 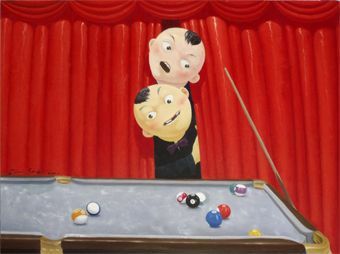 Zhang reports that children respond favorably to his paintings and adults are reminded of how to see the world from a child's perspective. Still, interpretations vary. For example, some people say it looks as if his children may be screaming—not from joy, but from fear of what may lie ahead in adulthood. Zhang responds that there is not only happiness in his images, but also a recognition that life has hardships and struggles. 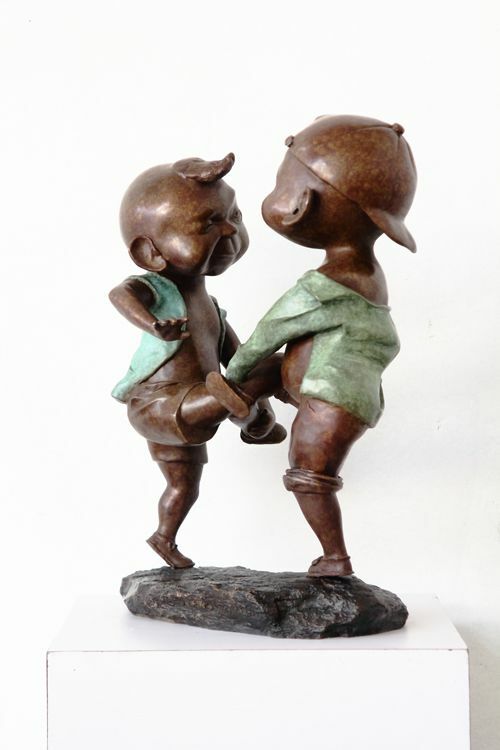 Zhang is pleased when viewers have different responses because it signals they are involved with his work. The artist continues to create insightful and meaningful works to this day. "Free access" Zhang Jian Long personal painting exhibition, Beijing. "Originally Experience" Zhang Jianlong Oil Painting Exhibition, 798 Gallery, Beijing. Works collected by China and foreign institutions and private collectors from China, Singapore, Hong Kong, America ,Australia, and Europe . 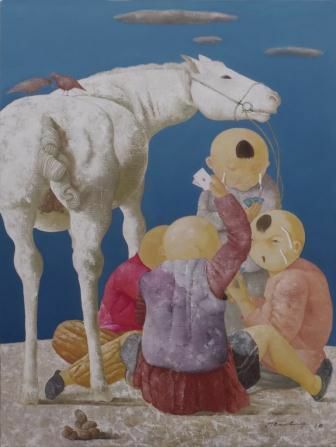 In this selection of paintings chosen for the exhibition "Original Experience," Zhang Jianlong combines elements of traditional folk arts such as shadow puppets, paper cutting and ceramics to produce paintings that depict a Chinese culture unadulterated by the complexities of modernity. A young man from Northwestern China, Zhang Jianlong combines earth and air to produce a sharp new vision, using bright colors to outline his subjects' inner worlds as he asks urbanized society to reflect on its experience. 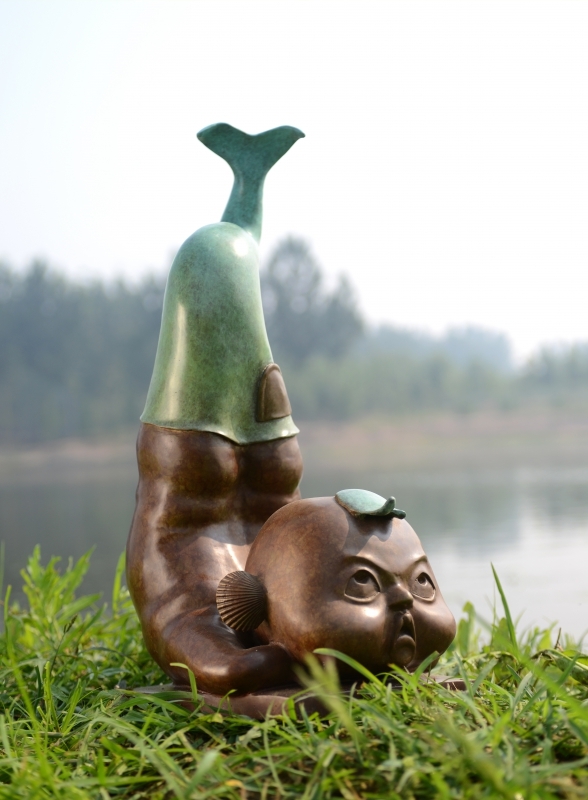 Zhang Jianlong's work should be seen as a sign that the young generation of artists born in the 1980's has arrived, bringing with them artistic language reflecting their unique cultural and historical background. 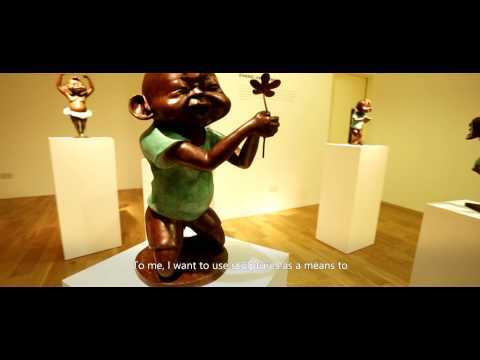 As we step into the 21st century we should stop to look back upon China's artistic history during the last decades of the previous century, with the "Sentimental Art" of the late 1970's, the "Neo Classicism" of the 1980's, the "New Age" and "Political Pop Art" movements of the 1990's all forming schools with very distinctive characteristics that were products of their times. The 2000's now bring the crunch of a collision between light and dark, of history colliding with present day reality, of capitalism vying with idealism, and of the will to live competing with the temptation to merely exist. This clash between light and dark, not only in art, but also in politics and economics, has created the necessary environment for the emergence of a movement towards a new conceptualism. In this pursuit, Zhang Jianlong uses color to show what life can be, with large flat swatches of color expressing the artist's clear and unyielding attitude towards the human experience. 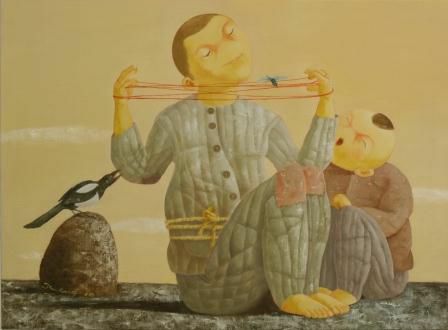 Zhang Jianlong's artistic language is at its sharpest when he employs the motifs of subjects partially rendered as leather shadow puppets and mouths that are stretched wide open. The subjects in his paintings walk down a road, as people in life walk along a path bounded by the realities of their individual circumstances. 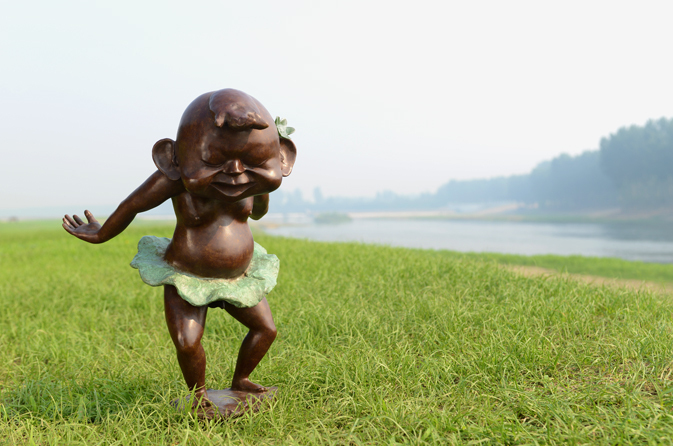 Zhang Jianlong walks along the promising yet inhibiting path of self-development. Language isn't always strong enough, the voice doesn't always carry, there is no way to free oneself from the toil of expression. The struggle the artist is engaged in is fully expressed in his work, courses through his veins and defines his existence as an artist. Yet after the surge of ideas ebbs, life is natural, passion is real, struggle is abstract, art is incisive and society is still complicated. Perhaps culture can explain philosophy, and perhaps in the reality of human life culture is ignored, so how can philosophy save reality? Only artists set out to experience the answers to these questions. Sometimes not as clearly but always full of determination, Zhang Jianlong's voice rings out as he stands together singing art's melody with this contingent of those who have made this choice. We know they have arrived. There is no need for them to stay on the sidelines with bound hands and feet. It is now time for the new generation to take the initiative and participate in the process of creating a better society. 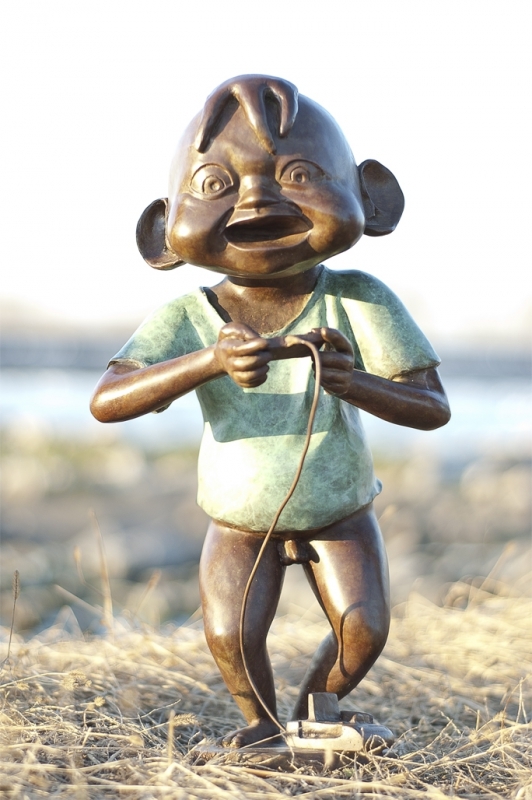 Those that know Zhang Jianlong soon discover he is a quiet person who likes to take life with a smile. The impression we get is that he is a genuine and gentle young man, yet his gentleness masks his underlying passion. In this instant, we are revisited by memories, we are reinvigorated; the unremitting pursuit of life gives affords us opportunity and passion. Zhang Jianlong's paintings have made a deep impression on me, with their snowcapped mountains, broad plains, childlike innocence, hardships, helplessness, and smiles. There is happiness, there are struggles, and there is freedom. The human is displayed alongside the natural, tranquility alongside conflict. The intensification of these contradictions allows the artist to gradually progress towards rational consideration and to reveal a search for deeper meaning on a simple canvas. The artist should not think of this before lifting his brush. On the contrary, it must burst forth from the subconscious. This is a choice, but also no choice at all. It is real, but also not wholly real. This feeling is right, this language has spoken and this attitude is more firmly fixed. Every artist, every generation, brings with them their own experiences and their own influences, woven together by culture and history. This grants art the power of memory and symbolism, giving it depth and interpretive meaning. 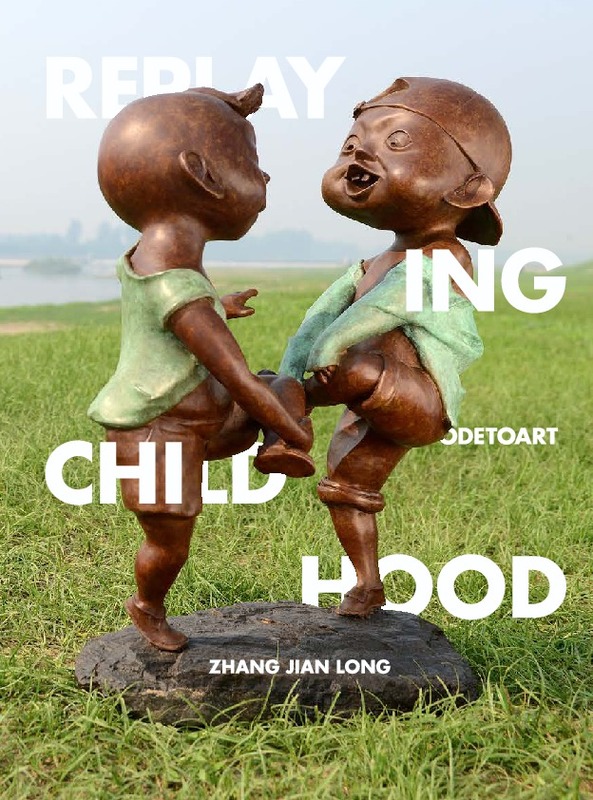 In Zhang’s works of glowing faces, uninhibited forms, forgotten games and resplendent simple joys- I see not only the overarching innocence and freedom of childhood, but also the riversides, the fields, the home he spent it in. In his works I see his experience, his influence, and most of all, the historic trails of a forgotten culture- keepsakes of a forgotten time.